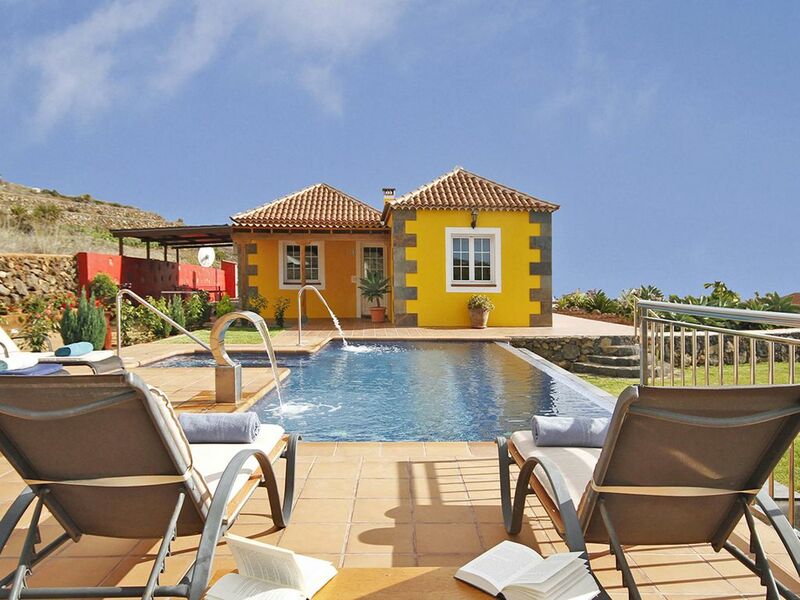 Luxury holiday villa on La Palma with private pool and panoramic sea views situated to the west of the island. This holiday villa offers all its comforts on one floor: 5 bedrooms (one with double bed, one with 2 single beds and 3 bedrooms with 1 single bed each), a bathroom with whirlpool shower and another bathroom with whirlpool bath, a kitchen with dining table and a very cosy living room with fireplace. For your entertainment Villa Tojayma has Internet, Smart TV, DVD player, music system, iPod connection, some gym equipment and a ping-pong table on the terrace. The outdoor area has a garden, sun loungers, a barbecue area and a wonderful private pool with integrated jacuzzi, counter-current swimming system, jet and massage nozzles. The swimming pool can be heated for a supplement of 15,00€ per day.